Glasgow, on a bad day. 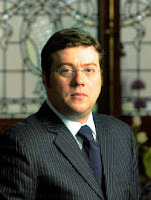 The Guardian quoted a UK government minister on 28 march 2014 as saying that a currency union would eventually be agreed during lengthy negotiations if Scottish voters supported independence. The minister, believed to be VINCE CABLE, said: "Of course there would be a currency union. "There would be a highly complex set of negotiations after a yes vote, with many moving pieces. "The UK wants to keep Trident nuclear weapons at Faslane and the Scottish government wants a currency union - you can see the outlines of a deal." Faslane, next to Scotland's largest city - Glasgow. Glasgow, once the Second City of the British Empire, now lies next to a dangerous nuclear weapons base. Just as Detroit is famous for its high crime rate, and Monaco is famous for its high life expectancy, Glasgow is famous for its high death rate. Life expectancy in Monaco is 90. In 2006, life expectancy in one part of Glasgow was 54, lower than in Bangladesh. Glasgow is famous for its sectarian violence - Catholics and Protestants. 1. "Wander out into the streets of Glasgow... and it is possible to mistake the place for an unexplored corner of New York." But, Glasgow has a higher death rate than New York. In Glasgow the death rate is particulary high for those in the age range 15 - 44. 2. 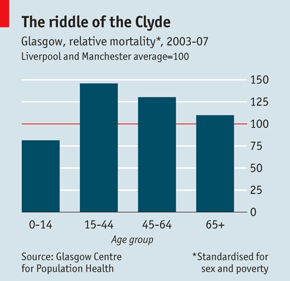 Even in rich parts of Glasgow, death rates are 15% higher than in similar districts of other big cities. The UK Ministry of Defence is struggling to deal with hundreds of safety blunders, pollution leaks and environmental lapses at the nuclear weapons bases on the Firth of Clyde. Official reports obtained by the Sunday Herald reveal that Faslane and Coulport have been plagued by nuclear accidents, radioactive contamination and fires over the last two years. The MoD is responsible for up to 220 nuclear warheads, used to arm Trident missiles on four submarines. The warheads are stored at Coulport, near Glasgow, and are regularly transported by road to and from the bomb factories at Aldermaston and Burghfield in Berkshire. 3. Up until 1950 Glasgow looked normal. But between 1950 and 1980 a gap opened up between it and other big cities in Britain. One reason was deaths from cancer. Then, starting in about 1980, the gap widened again. The old Glasgow, with its sense of community, seemed healthier? 4. "Adjusting for age, poverty and gender, Glasgow has more than twice as many deaths from drink and drugs as Liverpool and Manchester." But, Glasgow smokes and binge-drinks less than Manchester and Liverpool. The old Glasgow slums have been replaced by large anonymous housing estates where drugs gangs are a major problem. 5. The Glasgow Centre for Population Health examined 20 regions in Europe which, like Glasgow, went through rapid deindustrialisation. Glasgow came out sicker than all of them. This was "even when its residents were richer and better educated than their continental peers." Glasgow was built on the River Clyde and many of the worlds ships were built in Glasgow. 6. In Glasgow, there has been an increase in the number of deaths from drugs, drink and suicide since 1980. Do certain Glasgow gangsters have links to the 'powers-that-be'? The Daily Record wrote: "Local uniforms and CID could often be found sitting in the McGraws' home drinking tea and smoking." When McGraw bought The Caravel pub, certain well-known detectives were in regularly, drinking heavily and never putting their hand in their pockets." The people of Manchester and Liverpool eat just as few green vegetables as poor Glaswegians. 8. Richard Wilkinson and Kate Pickett, in their book 'The Spirit Level' claim that in very unequal societies everyone’s health suffers. Greater income inequality in Britain followed Margaret Thatcher’s election in 1979. 9. Glasgow moved many people from its friendly inner city 'slums' into vast, poorly policed, council estates, like Castlemilk, which had few amenities. But, other British cities also created these horrid housing estates. Conducted by Alan Doggett, 1969. I live near Glasgow and can tell you that Cancer is commonplace, it's blamed on drinking and smoking but often the victims don't drink or smoke. The victims only have their Geography in common, the only connection is being close to the nuclear submarines at Faslane.